Given that, while our kids aren’t quite ready to engage in an epic 6 hour Arkham Horror battle, we’re not willing to settle for playing Chutes and Ladders or Sorry with them all day, either. Our compromise has consisted of games like Catan: Junior, Zombie Dice, and Castle Panic. Zombie Dice is is our go-to quick game, and Castle Panic is awesome because it’s cooperative (though we do tend to play with some house rules that give us a better chance of surviving against the monsters), but our newest game, Dixit, is the sock-rocking awesomest game I’ve found yet! 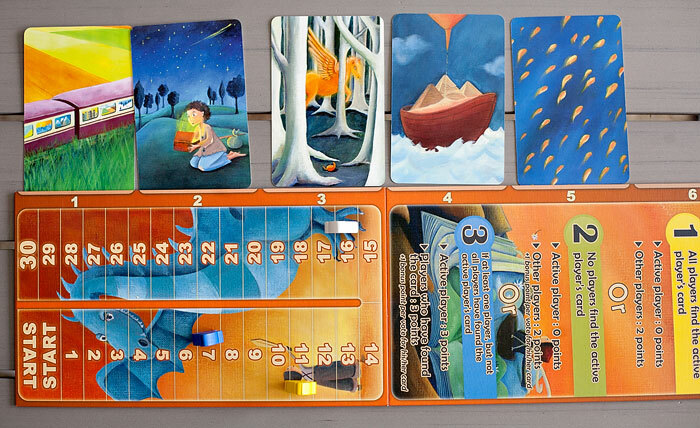 The players have hands of oversized cards with various artistic pictures. The active player secretly selects one of his cards and gives a very brief description. The other players secretly select their own cards which match the description. The chosen cards are shuffled and revealed, then players vote on which was chosen by the active player.Each correct answer gives points to the guesser and the active player. Each incorrect answer gives points to the player who submitted the guessed card. However, if all of the guesses are correct — or none of them are — then the active player gets no points and all the other players get points. I was actually introduced to Dixit by my sister and her husband who play it with their adult friends, so it’s absolutely not just a simple kids’ game. The one downside is that the single deck of cards that it comes with gets old pretty quickly. If 6 people are playing you can easily go through the entire thing in a single game and have to shuffle the discard pile and play the same cards again. Considering the fact that you’re making up descriptions for the cards, having to re-use a card that someone else already described isn’t the most awesome. The solution is fairly simple, they sell additional decks for around $20 a piece. We bought two, and I’m really happy with them. But, yeah…it’s pricey, especially if you’re used to buying games that cost $15 total and you’re done. I guess there’s actually one other drawback to Dixit, which is the 6 player maximum. Unlike other games where you can simply grab a token from another game to add additional players, working in more players for Dixit would require quite a bit of work. Once again, they sell a “fix” for the problem, a 12 player version of the game. Unfortunately, it’s $40. As a (soon to be) family of 6, I should have just bought the 12 player version to start with for when we want to play with friends, but having already paid $20 for the initial game, I’m not super keen on shelling out the additional dough at this point. I suppose there’s also one caveat…not necessarily a negative, but this is NOT a game you can play with only 2 people, and it’s most fun with 4 or more. I super love it anyway, though! All the artwork is so interesting, I mean if I were a bit more on the ball I could totally incorporate the game into an art unit study, or at the very least mention different styles of art that each card fits into as we’re playing. It’s also a fantastic game for developing higher-order thinking for kids (and challenges me, as well). Boo started out understanding the artwork on her card and applying that understanding by describing it nearly exactly. 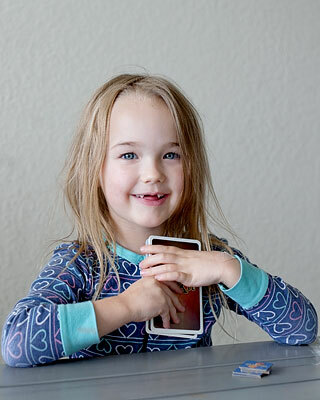 For example, if she had a card with a golden hourglass that was broken and had dust spilling out and a moon overhead she would say something like, “A thing that’s broken and gold dust spilling and a moon above.” The problem was that then everyone would be able to guess which card was hers and she wouldn’t get any points. As we’ve continued to play she’s gotten much better at analyzing the card and creating a more indefinite description such as, “Moonlight and gold.” Now, depending on what cards other people have to play that turn, her description still may or may not be vague enough to throw people off, but she’s definitely getting there! And half the time I have difficulty coming up with anything better myself without running the risk of being so vague that nobody guesses my card. ← SPD Friendly Halloween Costumes!